Over For the Day is a continuation of a body of work entitled ‘Disjecta Membra’ (translates – scattered pieces), a series of moving image and photographic works that explore society’s relationship with trauma and event, and the documentation of both. It depicts two events: the endless drifting of a bound and beleaguered figure in a bleak North European landscape and the disruption of matter, airborne in the atmosphere. Devoid of narrative, the figure exists in a space with no specific time or place, trapped in a seemingly pointless repetition of Beckett’esque style rituals. 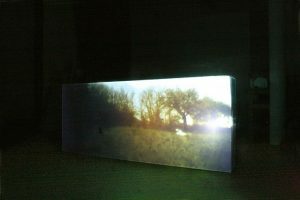 The film, taken in one continuous shot, was created by staging two events in the same location – filming through one event (the matter) to get to another (the perfomative figure). 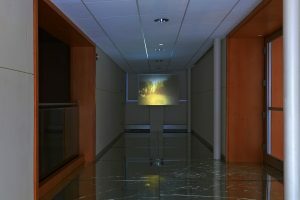 This filming through layers and screens was designed to add a remove akin to watching through a window of an interior space or on a monitor located elsewhere. 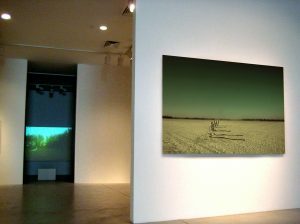 The sound reinforces this notion of both interior and exterior place, combining domestic and ambient noise to create two spaces; in front and behind the camera.